CDL OTR Driver $3,000 Bonus in 60 Days! 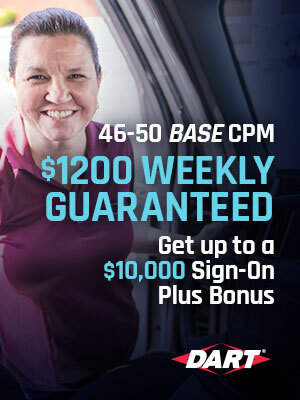 We are excited to announce our NEW $10,000 Sign-On PLUS Bonus for Company Drivers! Stay with Dart and you'll receive our NEW Loyalty Bonus that keeps on giving! • $3,000 Bonus in 60 Days - No Strings Attached •	HIGH BASE PAY for OTR Drivers $.46-$.50 CPM •	$1,200 Minimum Weekly Pay Guarantee for OTR Drivers •	Free 24” Flat Screen TV with DirecTV Subscription •	Pay Increase for OTR Drivers after 6 months •	An Additional $.035 CPM Monthly Bonus Pay for OTR •	Up to $6,000 in tuition reimbursement •	Paid Orientation •	And More! Join Dart and start Driving Like a Boss!